Unreal Lawns supply and install artificial grass in Whitefield and the north west of England. We serve domestic and commercial customers in the area, with products suitable for a wide range of applications from outdoor spaces and gardens, to event areas, exhibition space and more. See below for some examples of projects we've carried out in the Whitefield area. Our customer who’s based in Whitefield, Manchester, was getting fed up of their muddy lawn in the winter months, especially when the dog brought it into the house! The installation of our artificial grass has solved this issue, leaving a very happy lawn owner. The dog is now free to run around on the lawn, without leaving paw prints on the carpet when he comes back inside. A win, win for dog and owner. 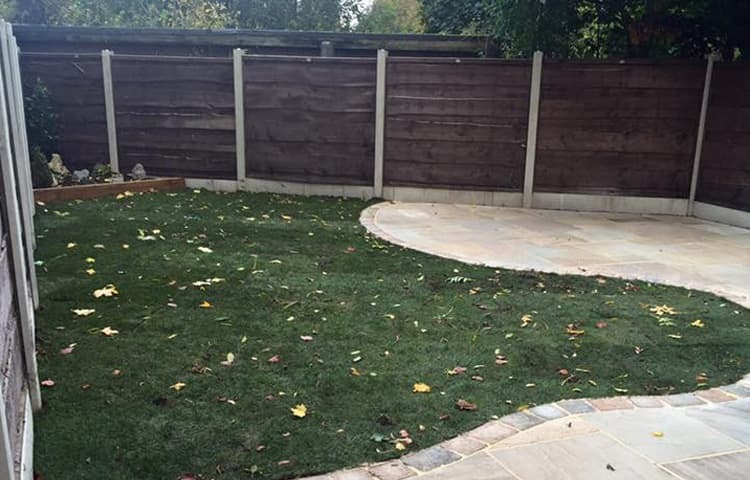 The grass used for this transformation was Supreme 38mm artificial grass. This provides a dense and soft feel with a longer and fuller look than our other grass products. The finished garden looks much neater, cleaner and smarter after the artificial lawn installation, and will require much less maintenance than before. If you like the look of this makeover, why not get in touch for a quote yourselves?